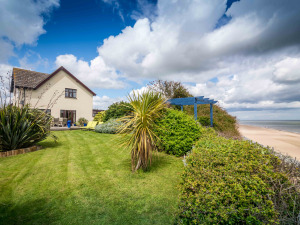 Beachside House Norfolk01493 730279work Self-cateringBeachside House in Scratby near Great Yarmouth is a luxury 4 bedroom detached seaside house set in a stunning location next to a sandy beach with superb sea views and hot tub. This spacious self catering seaside holiday accommodation with private garden with gazebo and decking areas directly overlooks the sandy beach. A hot tub in the garden room also overlooks the sea. The contemporary high gloss fitted kitchen includes ceramic hob, double oven, large larder fridge and separate larder freezer, microwave, built in coffee maker and dishwasher. A separate laundry room has a washing machine and tumble drier. The downstairs cloakroom has shower, WC and basin. The double aspect 24' lounge with stunning sea views has french doors to the decking area. A separate dining room seats 8 with french doors to courtyard area and BBQ. Beachside House has one double bedroom with king size bed, LCD TV and superb sea views and two further double bedrooms, one with sea views. The 4th bedroom has bunk beds and the best sea views of all. Luxury Egyptian cotton linen provided on beds throughout. Modern family bathroom with double jacuzzi bath, with roof light above for star gazing, separate shower. Sea kayak and body boards available for guests use. Beachside House Norfolk offers weekly bookings starting on Saturday. Beachside House in Scratby near Great Yarmouth is a luxury 4 bedroom detached seaside house set in a stunning location next to a sandy beach with superb sea views and hot tub. The region is easily accessible by road from all parts of the UK. Major trunk roads into Norfolk are the M11, A11, A12 and A14 from London and the South-east, while the A47 and A14 serve the Midlands and the North. From Great Yarmouth, follow A149, then B1159, at Scratby turn right into Beach Road. Follow into Rottenstone Lane and we are 50m on left. From Great Yarmouth - 4 miles. 1 & 1A bus from 67 Yarmouth bus station.